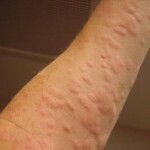 Treatment for hives or urticaria can come in the form of drug medications or natural / home remedies. If you intend to take drug medication, consult your family doctor so they can recommend the right drug. 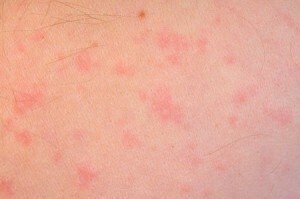 Antihistamines are the most widely used medical treatment for urticaria. These include cetirizine, hydroxyzine and diphenhydramine. Known as H1 receptor antagonists, their purpose is to prevent the disease from spreading and stopping the outbreak. H2-receptor antagonists may also work. Their focus is on managing urticaria symptoms. Well known H2-receptor antagonists include ranitidine and cimetidine. 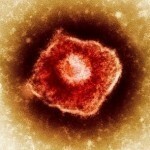 They work by minimizing the symptoms during an outbreak. Research has shown that H1 and H2 antagonists may be taken together. Note: H2-receptor antagonists were developed as cures for gastroesophageal reflux and peptic ulcers. 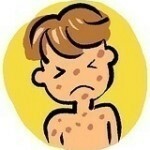 However, it has been shown they can minimize symptoms of urticaria. Tricyclic antidepressants (doxepin, for example) can also be used for treating urticaria. However, their use is limited due to the side effects that could be generated. Corticosteroids may be prescribed if the outbreak is widespread and intense. But like tricyclic antidepressants, long term usage is not suggested due to possible harmful effects. If outbreak is accompanied by pain or swelling in the throat, go to your doctor immediately. Swelling in that part of the body may cause to breathing problems. Most of these treatments are aimed at removing the itchiness. There are numerous methods and the following are just some of them. To get rid of the itchiness, prepare a cup of green tea and drink it every morning. Alternatively, green tea tablets may be taken. Other herbal teas you can try are peppermint, catnip, sasafrass tree and chamomile. These herbs are available in stores. Another simple home treatment for hives is a cold rag. Place it on the itchy part for ten minutes. You can dab milk of magnesia on the scratches instead. They can remove the itch because they are alkaline solution. A cornstarch bath may help too. Fill your tub ½ full with water. Add half a cup of baking soda and half a cup of cornstarch. Immerse yourself in it for several minutes every day. Eating certain food may trigger urticaria. Food allergens vary. But the most common known triggers are berries, nuts, soy products, eggs and milk. Other known food allergens are licorice, shellfish, tree nuts and wheat. 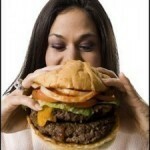 If food is the trigger, avoid consuming them. This will prevent any more outbreaks. Drugs like penicillin, aspirin and naprosyn may cause urticaria to appear. Medication for menstrual cramps can cause urticaria in some people. Other possible sources: animal dander, pollen, dust and insect bites. If any of these are the culprit, minimize or avoid contact with them. If you have urticaria, avoid wearing tight clothes. The disease can thrive in hot weather, so keep yourself cool at all times. When you get drug treatment for hives, make sure to follow the instructions as set forth in the prescription. If the illness does not go away, do not increase the dosage over what is recommended; inform your doctor.